something we all need . 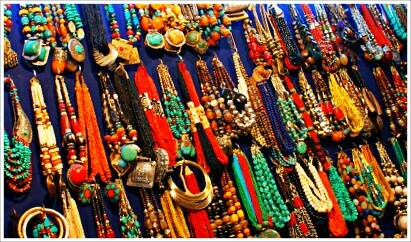 The hunt for the perfect match never ends ,Junk Jewellery/Fashion Jewellery is something every girl craves . From multi-millionaire to middle-classed college goer Junk Jewelleries are loved by every one . Junk Jewellery trends go through many changes , advent of the latest trends to reinvention of retros ,the journey goes on . If you are a 90’s kid I think you never Raveena Tandon sporting chockers . If your mom watches a lot of retros and you are a retro melody fan ,remember the song “Jhumka Gida re”?? Yes from Sadhana to Deepika Jhumkas indeed went through fashionable ressurection right! Ever Since Miss Padukone’s “Piku” released kolkata girls and delhi bongs are copying her style . Some of them carries the look so damn good . Even though I have the same proffesion as “Piku” I don’t quite believe in recreation . Well, that’s not ou topic for the day ,we’re not here with a debate .I would rather say today I am going to tell you all about places in kolkata that are best and most reasonable if you wanna buy Junk Jewelleries . If you are new college goer and you do not know where your seniors are buying those pretties ,and you are witty enough to understand that they telling you blatant lie when they say “ I don’t quite know sweetie my bf gifted me this “… hahaha don’t believe them men are ridiculous dumbos when it comes to buying junkiez .If he belongs to fashion designing , image consultancy proffesion or something then this is not true for them but , if you generalize you’ll see that I am not wrong . 1.Esplanade : Esplanade is one of the largest hawker’s market in the city .It is also famous for its trend synchronisation aspect . They say the latest trend hits mumbai market first .Trust me whenever the trend hits the city of joy , espalnade is the place you get . This open air hawkers market is for every one ,like latest chirpy pepppy junks to the oxidized posh ones you get all kind of fashion needs here . If you are a bargain queen trust me you end up buying smart .This basically an open air flea market you can open up you heart and shop. 2.Dakshineshwar Kali Temple Road : If you are a terracotta chic you get beautiful terracotta pendants ,wooden engraved artistry threaded jewellery here . 3.Swabhumi : Swabhumi is not quite visited by people in the city , basically swabhumi is for frequent boutique visitors . Our youth days were more about forum and south city than anything else but the generation that nurtutred swabhumi fantasies are much more culture-traditionally exposed than we are .Swabhumi is a place where you get tradional teracotta, wooden , and oxidized junk jewelleries . Infact you get certain uncommon jewelleries at swabhumi . I remember one rajasthani meena engraved pair of jhumkas my aunt gifted me . It was bought from swabhumi only , I have seen many pretty jhumkas in the city of joy and even delhi but nothing was even close to that pair . 4.Gariahat & Fern Road : In south kolkata also Gariahat is a huge place to explore if you are a shopaholic . The Gariahat market starts right from the place where triangular park ends and literally ends on one side where Fern Road’s Bijon Setu starts and Where Golpark Starts . Yes Gariahat is that huge …. Yes it extends till ekdalia towards the ballyguange connector too . 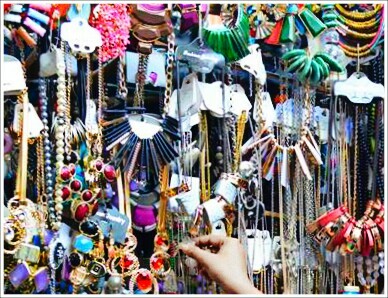 Thus if I say you get junk jewellies at gariahat and you literally take my works and visit , I swear you return with a reaction like “Are you freaking kidding me girl?” hahaha I am not … I am here to literally help you all .Gariahat literally spoils you with it’s flea market ambience . So if you are heading gariahat from Golpark,the open air market starts on both sides of the footbath after you cross the auto stand ,more specifically the axis bank .The market extends till gariahat bazar . Now if you cross the road and you walk towards ballygaunge you can look for unversal design and trends at the Indian Silk House adjacent foot . Now if you are moving towards fern road that’s where the real gold market of south calcutta stars . On both sides of the footh paths of Fern Road connctor you can get beautiful junk jewelleries . One Specially of these open air stalls ,I must let you know ,the more you start moving towards fern road the more the stalls of authentic kundan designs you see. The uber chic junk literally becomes less in number the more you head towards fern road . My favourite spot to buy junkies in Gariahat is the Golpark connector open sir market . You get oxides, teracottas, wooden beads , wood engraved peppy colored jewellery even chockers . 5.The Last but not the least is Dakshinapan: “Apan “ means a shopping outlet and “Dakshin” is South Dakshinapan is a govt. run shopping complex for south calcutta where you find best of handloom and handricraft of the entire nation. In Ultadanga also there’s one such shopping complex called Uttarapan named for the obvious reason . While entering Dakshinapan there are a few stalls that sells aunthetic uber chic junk jewelleries that are more inclined towards artistry side . I have a habbit of picking up at least one such piece every time I visit Dakshinapan . Inside Dakshinapan also there are a few shops where you get authentic boutique style hancrafted jewellery . In the handloom outlets you get authentic junkies of the state handloom . Like if you are visiting Odisha handloom you get the type of jewellery odiya’s sport . If you are a fashion enthusiast Dakshinapan is the place for you . Suppose you have a beautiful Kanjivaram Saree that you are going to sport for a special occasion . You can spice up your fashion statement buy selecting some jewellery from Jammu and Kashmir Handloom judging by the color and mix and match factor of your saree. That’s how you wear the authencity of south and elegance of north presented in fussion inspired fashion . If you are that intellectual fashionista go for it . I hope these informations will help you out ,next time you go for a junk jewellery hunt . Have a great time , happy shopping . I would love to hear about your Fshion Jewellery and Junkiez shopping experience specially if you are from some other city . Do share in the comment section .